Setup is awkward, but once you're connected the fast local speeds, unusual server locations and Smart DNS make it worth the effort. 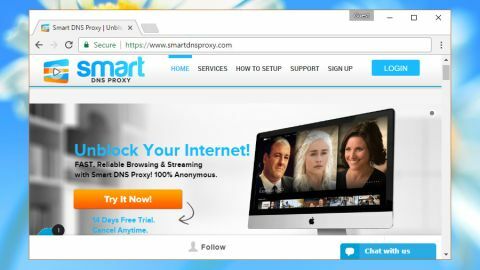 Smart DNS Proxy is a privacy brand of Global Stealth Inc, the company behind Getflix (a VPN which didn’t fare well in our recent review). The service combines a site-unblocking Smart DNS product with an apparently well-specified VPN: no bandwidth limits, five simultaneous connections, PPTP, L2TP & OpenVPN support, plus it’s torrent-friendly. There are more than 80 locations which go well beyond Europe and North America, and they include: Angola, Australia, Bolivia, Brazil, Hong Kong, India, Japan, Kyrgyzstan, Malaysia, Mexico, Mozambique, Nepal, New Zealand, Panama, Russia, Saudi Arabia, Singapore, South Korea, Ukraine and Vietnam. We were expecting premium prices, but Smart DNS turned out to be one of the cheapest VPNs around. A one-off month is $4.90 (£3.90, AU$6.35), subscribing for a year cuts this to an equivalent $3.33 (£2.65, AU4.30), and the two-year subscription is effectively $2.08 a month (£1.65, AU$2.70). We were even more impressed to see banners for a 14-day free trial, but that wasn't quite what it seemed. It's not made clear everywhere on the site, but the trial is for the Smart DNS feature only – the VPN can only be activated if you purchase a subscription. Smart DNS Proxy does a poor job of explaining its privacy and logging policies. Comments are brief, scattered around and grammatically dodgy, plus it wasn't always clear exactly which service the company was describing (DNS, VPN, website). The descriptions provided are often vague. The ‘what we collect’ clause, for instance, tells us the service "may collect personally identifiable information from users in variety of ways... including through online forms for ordering its services and some other instances users may get invited to volunteer such information." Well, that's clear, then. When the site does talk about logging, there's not a whole lot of detail: "There is also no logs in our network so all your queries are anonymous." Unsurprisingly, there's nothing at all on session logs. The rest of the small-print is presented in a more standard way, with the usual ‘we're not liable for anything’ and ‘you mustn't be a hacker’ sort of clauses. We couldn't see any real bad news, and on the plus side it might be possible to get a 30-day refund, although – surprise, surprise – the requirements for that aren't clear. Signing up for Smart DNS Proxy is easy, but configuring the program takes more effort. You must first activate it in a web console, a very unusual step, and then manually set up your device with the not-very-clear instructions. After downloading OpenVPN manually, we had to grab the relevant configuration files separately. These unzipped to folders with names like TCP-53, TCP-80 and UDP-443. Experienced users will immediately recognise the protocol and port options and have an idea what they'll need to use, but beginners are likely to be baffled. We eventually got online anyway and in our tests* found that short connections to the UK and other nearby countries were very fast, with download speeds consistently around 38-40Mbps. Going long-distance was mostly a different story. UK to California was usable at 15-20Mbps, but speeds fell drastically as we moved further away. Sampling Singapore gave us download speeds of around 3Mbps, Australia 5-6Mbps. It wasn't all bad news, and we did find a few speedy servers outside of Europe. New York was particularly impressive, with download rates barely changed from a UK connection. Keep in mind that you get access to the Smart DNS service, too. Even if you're not looking to unblock sites, setting this up ensures you don't give away your identity via a DNS leak. This VPN isn't designed for the beginner, but if you know what you're doing its excellent local speeds, wide range of long-distance (if slow) servers and ultra-low price look appealing. It’s worth signing up for a month to try it out.